This course will provide an historical overview of the Mexican Era 1821 and United States era 1847 to the current Hispanic issues in 2015. The Origins of Mexican stereotypes and the diversity of Central and South American countries are examined regarding national origins. Current social and political issues, immigration policy, discrimination and Hispanic demographic populations are examined. Educational obstacles related to the achievement gap, and instructional methodologies are presented along with social problems, Latino gangs, Chicano ideological influences, and current Hispanic political dynamics are also analyzed in module B. Academic achievement issues and educational settings are addressed throughout the course. The Hispanic Students and Issues courses are designed in two modules for three credits per each module. Analyze statistical, educational, and social demographics of Hispanic students. Review the Mexican era 1821, United States era 1847 and 1900's to 2015.
Review contributions of farm labor, industrial manufacturing & service industries. Examine the origins of Mexican stereotypes and myths regarding immigration. 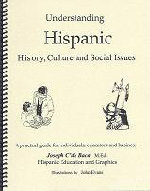 Learn about and contrast various Hispanic cultural views, behaviors, and traits. Understand Hispanic religious beliefs and the immigrant assimilation process. Discern between traditional cultural behaviors and U.S. media social forces. Learn about and discuss the current social- political issues affecting Hispanos. Learn diagnostic skills- strategies to improve student academic achievement. Examine the social backgrounds of Hispanic families and inter-ethnic diversity. Learn about the various Hispanic educational obstacles and school dropout issues. Review learning theory-methodology for improving instructional effectiveness. Learn about current Latino/Chicano social subcultures and political ideologies. Research, design and apply instructional units/lessons for classroom use.